Chloe was part of the squad that became National Champions at Future Cheer Internationals in Bournemouth 2017 and brings a wealth of experience and knowledge to the team and shows a lot of commitment in helping develop our younger cheerleaders in the squad. 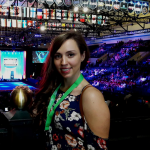 A qualified coach at USASF levels 1 – 5 in stunts, tosses and tumble, Chloe heads up the tumble programme, runs the level 1-3 tumble sessions, youth development squad and recreation squads. Chloe will also be coaching Queens, Senior Level 2 and Storm Senior level 1 our 2019 Summit team.